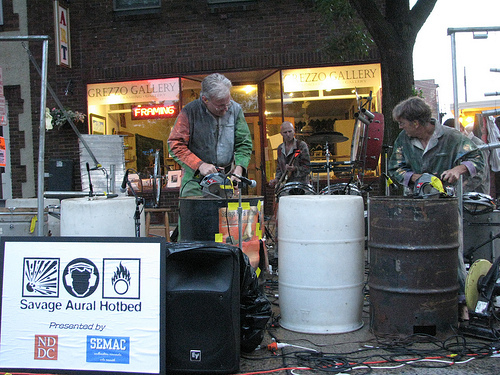 The rain stopped (finally) and Savage Aural Hotbed drummed up the kick-off the the 6th Annual ArtSwirl. It was a heck of a lot of fun. Friday, August 14th, features a Noontime Organ Recital, performed by Stephen May, 12:15 p.m., at Skinner Memorial on the Carleton College Campus, “Animation Exploration“, featuring rare film screenings and animation activities, 1:00 p.m. to 2:30 p.m. at Northfield’s Historic Carnegie Library, a Downtown Studio Tour and Gallery Crawl, 4 to 8 p.m., Ballet on the Bridge and in the Square, 6:00 and 6:45 p.m., and then the Butch Thompson All Stars, 7:30 p.m., at the Grand. Saturday, August 15th, begins with the Tour d’Art, 9:00 a.m. dedication at the Peggy Prowe Pedestrian Bridge, the “Shop 4 Art” event, 11 a.m. to 4 p.m. in Downtown Northfield, featuring locally-designed, hand-crafted items, Art in the Park, 11 a.m. to 5 p.m., Central Park, including, the local talent portion of the Northfield Jazz Fest, 12 to 5 p.m., Central Park, and Lowbrow/High Octane, 6 to 12 p.m., Downtown Northfield. Sunday, August 16th, it’s “Storytelling: Real Lives Aloud“, 2:30 p.m., Northfield Arts Guild Theater, a Japanese Garden Tour, 2:30 p.m., and Politics and a Pint on Arts and Economic Development, 6 p.m., at the Contented Cow. Photo courtesy of Doug Bratland; for more information see the ArtSwirl WebSite.